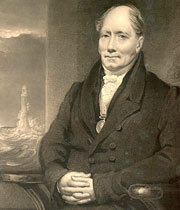 Robert Stevenson was not yet 39 years old in February 1811 when light first shone from Bell Rock Lighthouse. His reputation was already assured, though he did not neglect other avenues of engineering. By 1821 he had established one of Scotland's leading locally-founded civil engineering practices. 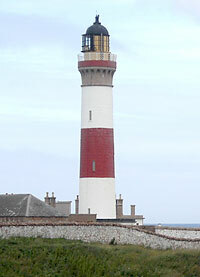 However, Stevenson did inaugurate the modern lighthouse service in Scotland. He went on to build at least a further 20 lighthouses and he remained engineer to the Northern Lighthouse Board until 1843, carrying out regular inspections of their installations — flying his own pennant to alert lighthouse keepers to his arrival. The recognisable style of his lighthouses is characterised by their conical towers, domed lanterns and flat-roofed adjoining dwellings — these days the majority are Category A or B listed buildings. Of the lighthouses he designed after 1811, all but two were constructed for the Northern Lighthouse Board. Toward Point Lighthouse was built for the Cumbrae Lighthouse Trust and Douglas Head Lighthouse for the Isle of Man Harbour Commissioners. In the second decade of the 19th century Stevenson designed five lighthouses — Toward Point (completed 1812), Isle of May (1816), Corsewall (1817), Point of Ayre (1818) and Calf of Man (1818). He and his wife Jean produced two more sons, who would later join their father to become celebrated lighthouse engineers — David Lillie (1815-86) and Thomas (1818-87). A coal-burning beacon was established on the Isle of May, Firth of Forth, in 1636. This was the first permanent light station in Scotland and the last one to be in private ownership. The Northern Lighthouse Board bought the island in 1814 and Stevenson's lighthouse was completed in 1816. Its 24.1m high square-plan unpainted masonry tower and adjoining dwelling resemble a castle. His grandson David Alan Stevenson (1854-1938) would install a new lantern there in 1924. Stevenson's Calf of Man Lighthouse, on an islet off the south west tip of the Isle of Man, has twin towers — high light and low light — to illuminate Chicken Rock to the south. In 1869-74, it was replaced by a lighthouse on Chicken Rock itself, built by Stevenson's sons David and Thomas, which began shining in 1875 and is still operational. From 1874, the original lighthouse was used as a shore station for Chicken Rock. Stevenson completed another five new lighthouses in the 1820s — Sumburgh Head (1821), Eilean Glas (1824), Rhinns of Islay (1825), Buchan Ness (1827) and Cape Wrath (1828). He also rebuilt Thomas Smith's 1788 Mull of Kintyre Lighthouse and the twin towers of Smith's 1794 Pentland Skerries Lighthouse. He constructed a low light tower at Smith's 1790 Pladda Lighthouse off Arran so that it could be distinguished from other lights. Sumburgh Head Lighthouse, on the southern tip of the Shetland mainland, is the oldest lighthouse in Shetland. Its 17.1m high white tower has a double wall thickness construction to protect against damp. The keepers’ accommodation is now used by the RSPB and for overnight visitors to the Sumburgh Head Nature Reserve. At Eilean Glas Lighthouse in the Western Isles, Stevenson added a second tower near the 1789 one built by Smith, which it replaced. Stevenson's structure is 29.9m tall and painted with alternate horizontal red and white bands. Buchan Ness (Buchanness) Lighthouse at Boddam in Aberdeenshire had a twinkling light that revolved faster than any other when it was first exhibited in 1827. The islet on which it stands was connected to the mainland by a timber bridge in 1834, at Stevenson's direction. His grandson David later instructed (1907) that a central red band be painted on the 35.1m white tower, so it could also be used as a day mark. At Cape Wrath Lighthouse, on the north west tip of mainland Scotland, Stevenson had first to construct both a quay some 1.5km from the site to import building materials and an access road 19km long with numerous bridges. In the 1830s Stevenson was even busier designing lighthouses, and seven more were finished — Tarbat Ness (1830), Mull of Galloway (1830), Dunnet Head (1831), Douglas Head (1832), Girdle Ness (1833), Barra Head (1833) and Lismore (1833). Tarbat Ness Lighthouse, on the peninsula between the Firths of Dornoch and Moray, is the tallest lighthouse on the Scottish mainland at 41.1m. Its white tower is painted with two red bands. No trace now remains of Stevenson's Douglas Head Lighthouse at the entrance to Douglas Harbour on the Isle of Man. It stopped exhibiting a light after 1850 and when the Northern Lighthouse Board assumed responsibility, it was demolished and replaced by a new tower built in 1857-59 by his sons David and Thomas. Stevenson's son Alan was resident engineer for the Girdle Ness (Girdleness) Lighthouse in Aberdeen. This was the only Scottish lighthouse to have two fixed lights on one tower. The lower light was shown from a glazed cast iron gallery at about one-third of the way up, but was discontinued in 1890 when the upper light was upgraded. Barra Head Lighthouse, on the island of Berneray at the south of the Outer Hebrides, probably has the most dangerous landing place in Scotland. It is also Scotland's highest lighthouse — the light on its 18m tall white tower is 211.2m above sea level. Stevenson also turned his attention to lighthouse illumination, developing further Thomas Smith's pioneering work with curved reflectors and oil lamps. He improved the catoptric system, which uses silvered copper parabolic reflectors and Argand lamps, increasing the power and range of the lights. As more lighthouses were built around the country, it became more difficult for those at sea to distinguish between them, even where there were two fixed lights, such as at Pladda, Pentland Skerries, Calf of Man and Girdle Ness. To alleviate this problem, Stevenson devised intermittent and flashing lights. Stevenson's portfolio of lighthouses is impressive and represents a large part of his marine and maritime engineering, but he still found time to apply his skills and ideas in other areas. In particular, he applied his growing knowledge to the design and modification of other water-related features such as harbours, sea walls, bridges, canals and river navigation works.